Realize that everyone has sinned and can not live up to God's standard of holiness. Romans 3:23 says, "For all have sinned and fall short of the glory of God." Understand that the penalty for our sin is death. 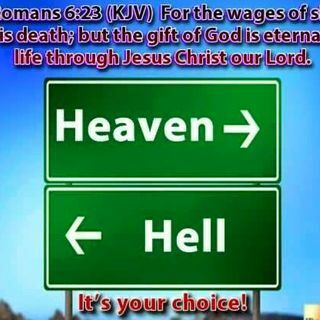 Romans 6:23 states: "For the wages of sin is death, but the gift of God is eternal life in Christ Jesus our Lord." Accept God's gift. God sent His Son, Jesus Christ, to ... Más informaciones die in our place, so we could be spared from hell. Romans 5:8 says, "But God demonstrates his own love for us in this: While we were still sinners, Christ died for us." According to the Bible, we aren't required to subscribe to a religious formula or do more good things than bad ones. God gives His gift freely to all who ask. "Everyone who calls on the name of the Lord will be saved" (Romans 10:13).